Ilona Szwarc (b.1984 Poland) has had a solo exhibition at Claude Samuel gallery in Paris and Maison de la Photographie in Lille, France. She has exhibited in group shows internationally in London, Bilbao and New York. Her work has been featured in publications worldwide including The New York Times Magazine, TIME, The New Yorker, The UK Sunday Times Magazine, The Telegraph Magazine, Surface China, PDN. Ilona won a World Press Photo award in 2013 for the Observed Portraits category, 3rd Prize; PDN 2012 Annual in the Personal Category and has been awarded Grand Prize in the Fine Art category of the PDNedu 2013 contest. She has been selected for American Photography 28 and 29. Her project “American Girls” has received worldwide recognition, having been highlighted in The New York Times Lens Blog, MSNBC Today.com and The Huffington Post, among others. Mikolaj Nowacki (b.1972, Poland) received his Master’s degree in International Law, pursuing a doctoral thesis that examined environmental aspects of International Space Law. He discontinued his doctorate to focus on documentary photography and worked eight years for major Polish newspapers. His work has been published in the Polish editions of National Geographic and Newsweek and also in The New York Times Lens Blog and Le Monde among others. Mikolaj has won numerous awards and was a finalist in a number of Polish professional photography contests. He was also nominee in Prix Pictet and achieved Special Mention in Winephoto International Photo Competition. In 2013 he finished his two year Mentor Program with VII Photo with Antonin Kratochvil followed by a solo exhibition “Odra” at the VII gallery in New York. He is based in Wroclaw, Poland. Andrew Renneisen (b. 1992, USA) is currently enrolled at the S.I. Newhouse School of Public Communications at Syracuse University. He is currently an intern at the Philadelphia Inquirer, and has previously worked at The Press of Atlantic City in Atlantic City, NJ and at The News Journal in Wilmington, DE. He was a recipient of the 2013 Alexia Foundation Award of Excellence for his work on Violence in the United States, and is a member of the Eddie Adams Class of XXVI. He has also received awards from the NPPA and the S.I. Newhouse School. His work has been published in The Washington Post, Denver Post, The Philadelphia Inquirer and other publications. Dijana Muminovic (b.1983, Bosnia) moved to America 1997 and earned a BA in photojournalism at Western Kentucky University. In Bowling Green, she began exploring the stories of some of the six thousand other Bosnian refugees who still wait for their loved ones to be found and identified from the many mass graves that still exist in Bosnia. That work was exhibited in the US Congress Building. In 2011, she organized and hosted the American workshop, Truth With A Camera in Bosnia. Dijana was a finalist for the Photo Philanthropy Activist Award. She was awarded two grants from the Kentucky Foundation for Women. In 2013, she was a 2nd place winner from the Alexia Foundation. She currently teaches photography at The Athens Photographic Project to those with mental illness. Sasha Rudensky (b. 1979, Russia) studied Studio Art and Russian Literature at Wesleyan University where she received a BA in 2001. She received her MFA in photography from Yale University in 2008. Her work has been featured in American Photo and PDN and exhibited at Aperture Gallery, Musee de l’Elysee, Lausanne, Switzerland and Les Rencontres d’Arles, France. Sasha is currently an Assistant Professor of Photography at Wesleyan University. She resides in Brooklyn. Posted by Geoffrey Hiller in Burma, Myanmar. Today we made our goal- it’s been quite a trip in Kickstarterland, working 24/7 to spread the word. Looking at the data, the progress was a slow and steady climb. Midway there was a lull and I did wonder if we were going to make it. But backers rallied…together we did it. I can’t wait to get started on the production, to sit down with the designers and start laying out the book. There are three days left, and now we are in ‘stretch’ goal territory. Even though we have the minimum funds to publish, any further pledges will go directly into the project. It’s not over till it’s over: if you haven’t yet made a pledge, you can still do so. The deadline is Wednesday, Oct. 9 midnight EST. 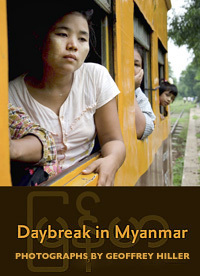 What is really exciting is that a Burmese friend from Yangon emailed me last night to say he’s eager to help distribute the book. I interviewed him in January 2012, a remarkable time when political prisoners were being released, and pent-up emotions were surfacing. He was part of the 1988 opposition movement, and now runs a non-profit that works on education issues. Less than two years ago, this would have been unthinkable. From the series ‘Living in the Shadows’. Wilcannia, New South Wales, Australia, 2012. David Maurice Smith (b. 1973, Canada) is a Canadian documentary photographer based in Sydney, Australia whose photography is informed by a previous 10 year career in social work supporting individuals in disadvantaged communities. In 2013 David was named Australian Emerging Documentary photographer of the year as well as being named winner of the $10,000 POOL Grant for his ongoing project in Wilcannia, a rural Aboriginal community. He joined Australia’s Oculi photographic collective in 2012 and in 2011 he was awarded the LIFE Magazine Grant at the Eddie Adams Workshop in New York. His work has been published by The New York Times, CNN, Monocle Magazine, Hufﬁngton Post, The Sydney Morning Herald, The Telegraph, The Australian, SBS, VICE, Hemispheres Magazine and The Surfer’s Journal.